The DRFC ventured to Lawrence, Kansas, for the opening rounds of the D1AA XVs national playoffs. Dartmouth came away with two victories, on consecutive days, defeating the University of Missouri and the University of Central Florida, respectively, to advance to the spring championships for D1AA play. In the first match against Missouri on Saturday, Dartmouth dominated possession in the first half, containing play inside Missouri’s twenty-two. Patrick Sheehy ’20 led the team with his boot, slotting all three of his penalty attempts and converting three of four tries. Seniors Julien Johnson ’18, Steve Hinshaw ’18 (co-captain), and Ollie Engelhart ’18 (co-captain), filled out the scoring of the first half, with a try each, and the Big Green went into halftime with a comfortable 27 - 3 lead. Mason Koch ’20 excelled defensively, forcing multiple turnovers through his rucking efforts. The second half saw Big Green scoring efforts and general play slow down, as penalties plagued the half. 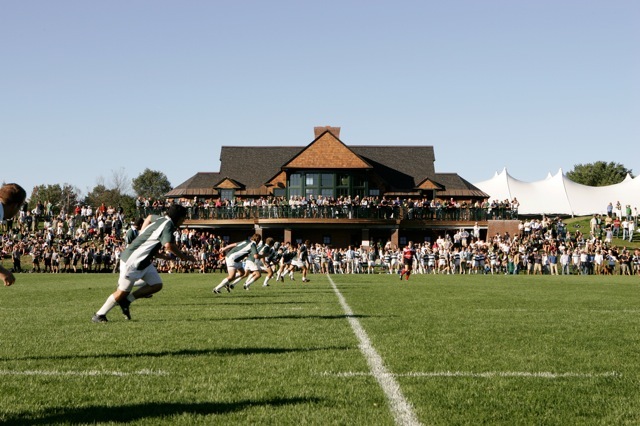 Five total yellow cards were handed out in the half, including three to Big Green players, leading to one DRFC member declaring that the sin bin was, “the most densely populated area in Kansas right now.” Nonetheless, Fuller Winton ’19 would score the DRFC’s lone try of the second half off of great ball movement from Sheehy ’20 and Johnson ’18, before substitutes came on to close out the victory. Dartmouth would walk away with a 35 - 10, earning the right to play UCF on Sunday, the next day, with a spot in the D1AA spring national championship at stake. The next day, feeling fresh off of physical recovery following the game from the previous afternoon, Dartmouth delivered. Engelhart ’18 would score the first try a few minutes in, and the Big Green never looked back. Sheehy ’20 again delivered a brilliant game with his boot, connecting both of his penalty attempts and converting five of six Dartmouth tries in the half, including one from the touchline. Lead by brilliant set-piece play by the forward pack and consistent conversion of goal zone opportunities, Dartmouth went into the half with a 46 - 0 lead. Dartmouth would continue to stretch its lead going into the second half. Engelhart ’18, Jack Badenhausen ’19, Luke Bienstock ’20, and Gyorgy Brevnov ’20 each finished the game with hat-tricks. Freshman Jarrett Lewis ’21 also contributed to Dartmouth’s scoring efforts after coming off the bench, and Mason Koch ’20 again provided a brilliant match on both sides of the ball. Dartmouth emerged victorious by a score of 83 - 0. On April 21st, Dartmouth ventures down to East Carolina University in Greenville, NC to take on the University of Nevada, Reno Wolfpack in the D1AA Spring Final, representing the semifinal game of the at-large D1AA National Championship.